This Venus concept features an advanced landscape master material. The landscape is textured using a method of procedural alpha blending, and eliminates the need for (pain)ting. This method provides extreme customization allowing a unique look to your project based upon the alpha that you create. We used 6 layers for a randomized natural appearance, and a 7th layer was included in order to compensate for background texture tiling using pixel depth. 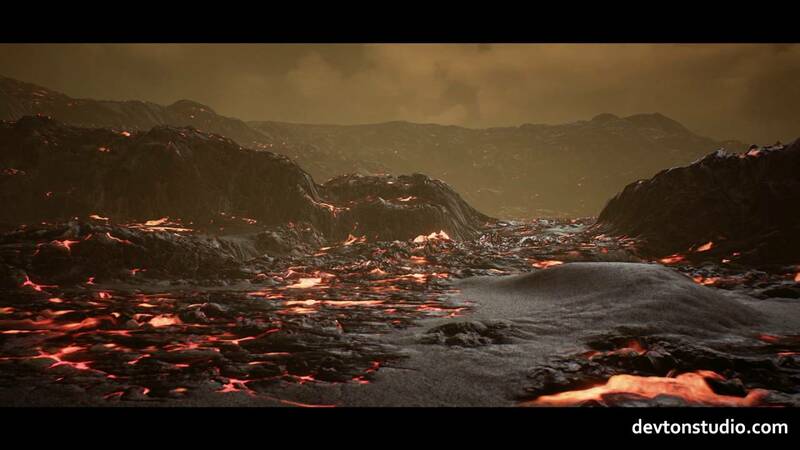 We created two material functions specifically for the lava system, allowing for procedural distribution, emissive color and intensity, as well as a gentle lava flow separate from the main material. A special post process material was created to give a hot air effect to the lava. Also we prepared a material with a random positioning system for lightening. The Venus master material also features a new automatic cliff generation system based on a slope function that includes alpha based blending specific to cliffs. Last edited by devtonstudio; 07-16-2016, 03:21 AM.